Luxe Organix Soothing Aloe Vera Gel + Charcoal Nose Pore Strips Review ~ Live. Share. Inspire. I was in the province for my mother's birthday, when I shot this video. 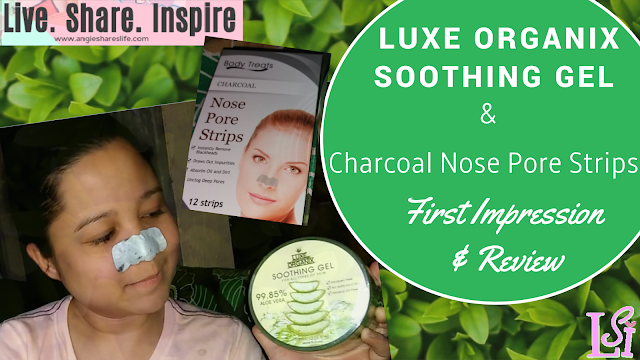 I bought the soothing gel and charcoal nose pose strips from Watsons. I tried it with my sister. I have documented the experience here. I hope you like the video! Don't forget to subscribe. Watch our for then music at the end of the video. I can't help but groove. As I age, I can obviously see and feel the difference in my skin's glow. I started to notice dry patches, wrinkles and irritation. I always wanted to look as youthful as I was before but I just can stop time. Nonetheless, I believe that even if ageing is inevitable, I can still find ways to age gracefully. I will be incorporating in this blog my journey towards healthy skin, struggles/successes in doing make-up and vlogs which I hope to bring inspiration to my viewers/readers. You must be a kind people because you share your knowledge through articles.I have read all your articles. I hope I can read them more and more.I'm thankful if you can upload more posts later.